London, November 29, 2017 – According to a new analysis by Creation Inn of the global lithium-ion end-of-life market, the total amount of recycled lithium can reach 5,800 tonnes (30,000 tonnes LCE) in 2025, while cobalt is expected to reach 22,500 tonnes. Long service life, positive prospects for second use and poor collection of portable batteries are the main contributors to the relatively low volume. More than 66 percent of the lithium-ion batteries, or 191,000 tonnes, is expected to be recycled in China, feeding the country’s fast-growing battery material industry. The percentage will be even larger for the important cobalt-containing batteries. 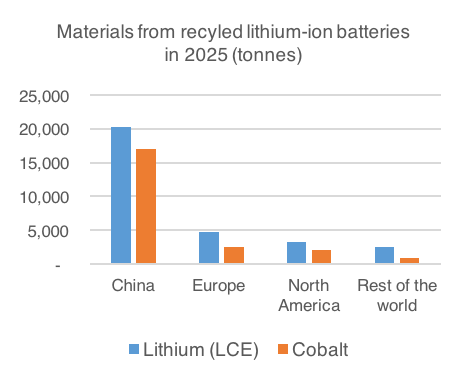 76 percent of the cobalt in 2025 is expected to be recycled in China without taking production scrap or other sources into account. In the first analysis of the global end-of-life value chain for lithium-ion batteries Creation Inn finds excellent prerequisites for a global circular model with batteries moving from first to second use to ultimately be recycled in closed-loop solutions, bringing old material to life in new batteries. However, for Europe and North America the race for closed-loop solutions can already be lost to China. Large amounts of current end-of-life batteries are exported to China benefiting both the Chinese recycling industry and the domestic producers of battery materials. When volumes eventually increase in Europe and North America the Chinese recycling industry will have a strong competitive advantage through proven technology and available capacity. Better opportunities are given the automotive industry which have an excellent opportunity to capture a substantial part of the energy storage market by taking back electric vehicle batteries and use them in utility-scale storage solutions. The model connects well with similar solutions for vehicle-to-grid in which the vehicle is used as a grid-connected battery, and provides strong growth opportunities while also compensating for revenues that will be lost when sales of spare parts and services are decreasing due to the limited need for maintenance of new electric cars. The analysis from Creation Inn anticipates that at least 60 percent of the batteries from electric vehicles will serve in second use solutions before they are sent to recycling. From a raw material perspective recycled battery minerals such as lithium, cobalt, nickel and manganese can be found in new batteries already today. However, the volumes in relation to the rapidly increasing need for materials are still minuscule especially for lithium. Investments in additional recycling capacity and implementation of new technologies in China, together with the already steep price increase for lithium and cobalt provide important drivers for change. In 2025 the amount of cobalt from recycled batteries is expected to reach almost 20 percent of the demand. Most of this is expected to be recycled and re-synthesized to new cathode material ready to be used in Chinese cathode manufacturer’s processes. The report from Creation Inn is written by Hans Eric Melin who has spent 8 years in the battery recycling industry and more than 15 years in energy and environment-related industries. The study is the result of six months of research based on discussions with industry players, studies of available research and personal experiences from the lithium-ion end-of-life industry. Besides volume forecasts the report contains overviews of the current end-of-life market, different recycling methods and the emerging second use market. It also discusses challenges and opportunities for current and new companies in the lithium-ion value chain. The report “Circular opportunities in the lithium-ion industry” can be purchased at www.creationinn.com.